Featured in many Hollywood westerns and a designated Navajo Tribal Park, Monument Valley lies 243 miles east of Zion National Park and offers visitors a glimpse into southern Utah's cultural and geological history. Separated by 245 miles, experience southern Utah's diverse desert landscapes of Zion, Monument Valley, and Arches National Park. Marvel at the colorful sandstone formations during sunset from the deck of one of the few valley lodges. 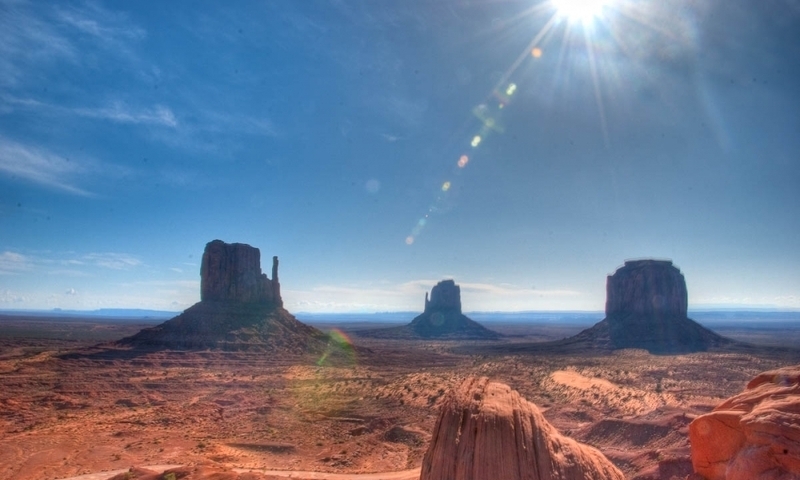 Tour Monument Valley by scenic drive, a guided hike, or even a hot-air balloon flight. Known for spectacular sandstone formations rising out of the desert floor and often featured in Hollywood westerns, Monument Valley is home to the Navajo Indian Nation and 243 miles east of Zion National Park. To truly experience the diversity of southern Utah's desert landscape, visitors can combine a road trip to Arches, Monument Valley, and Zion National Park. Located on the southern border of Utah and northern Arizona, Monument Valley lies near the Four Corners area within range of the Navajo Nation Reservation. Accessible by scenic byway Route 163, it is approximately 162 miles south of Moab, 190 miles north of Flagstaff, and 243 miles east of Zion. Although limited in variety, lodging, RV parks, and developed campgrounds can be found in Monument Valley itself, as well as the nearby towns of Bluff, Blanding, and Mexican Hat. Options range from resort-style lodging overlooking Monument Valley to chain motels. Services such as fuel, restaurants, and grocery stores are also limited. It is best to stock up on supplies in the nearby Utah towns of Mexican Hat, Bluff, Blanding and Kayenta in Arizona. Hiking permits and camping information is available at the Monument Valley Navajo Tribal Park Visitor Center. Popular with Hollywood for western movie backgrounds, Monument Valley boasts unique sandstone buttes, some rising up to 1,000 ft above the valley floor. Visitors can tour the area by foot, a scenic drive on a 4-wheel drive dirt road, or even by hot-air balloon. Keep in mind hiking is only allowed with a guide, which can be hired at one of the lodges or visitor center. In addition to the Monument Valley Navajo Tribal Park Visitor Center, several area lodges feature museums and guided tours that focus on the area's cultural history, as well it's geological wonders. There are a variety of guided tours, such as a full moon tour, hiking tours, and the Mystery Valley tour. Many points of interest are only accessible during these guided tours, and include Anasazi petroglyphs, Hollywood sets, and towering rock formations. From Monument Valley travel south on Route 163 to Kayenta, Arizona. If your car's gas tank is below half-full topping it off in Kayenta is recommended. From here turn right on Route 160 a barren desert route that accesses the Navajo National Monument, site of three remarkably preserved Ancestral Puebloan cliff dwellings. After 42 miles turn right on Route 98 and follow for 66 miles into Page, Arizona, a toddler of a town by Old West standards (founded in 1957) that owns its existence to the construction to of the Glen Canyon Dam. From Page, follow Route 89 west, back into Utah, as it snakes through the Grand Staircase-Escalante National Monument and passes Paria Canyon, famous with hikers for its series of slot canyons. At Mount Carmel Junction, Utah, turn left on Route 9 and follow for 12 miles to Zion National Park's eastern entrance.